Visual Lure recently completed a new website for Rivas Photography. Rivas is a soon-to-be husband and wife photography team based out of Kansas City, MO. They specialize in wedding, engagement, corporate event, professional sports and newborn baby photography. They are known for their clean, bright, vibrant and dramatic imagery. They also happen to be good people which is a pretty important characteristic you want your photographer to have. I had the pleasure of meeting Kyle and Melissa (the owners) this year at Shutterfest 2016 – where I spoke to professional photographers about branding and search engine optimization (SEO). They took my SEO class which will help their already well ranking website climb even higher. This brings us to Rivas’ search engine rankings. 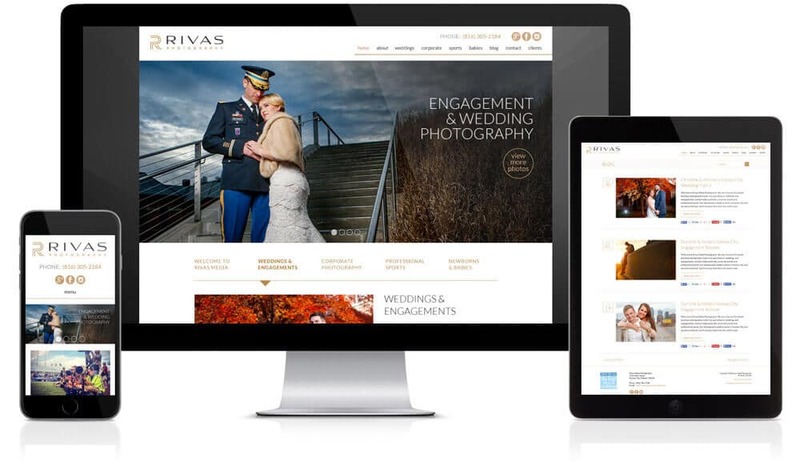 Before Visual Lure designed and developed Rivas Photography’s new website, they were using Square Space. While Square Space is super easy to setup, use and maintain, their websites tend to load very slowly. What’s the big deal with having a slow loading website? Having a slow site provides users with a bad user experience. This can effect bounce rates and cause users to “pogo-stick” back to their original search – both of which are proven to negatively effect a website’s search engine rankings. Before their new site, they were ranking somewhere beyond the first 15 pages of Google for most of their targeted search terms. As of today, April 2nd 2016, on Google searches: they are on page 1 for “kansas city event photographer”, page 1 for “kansas city sports photographers”, page 2 for “kansas city engagement photographers”, page 4 for “kansas city newborn photographers” and page 4 for “kansas city wedding photographers” (climbing more than 10 pages in Google in one month). The website also ranks well for many variations of those keywords. Within the first month of the new website going live, Rivas Photography acquired five new clients, all directly tied to Google search leads. This has lead to Rivas’ initial investment being paid back three times over. This, ladies and gentlemen, is why we do what we do. We love nothing more than helping other entrepreneurs find success. We couldn’t be happier with these results. We wish Kyle and Melissa future success in both their business and their upcoming nuptials. Learn more about our website design services or our fully custom WordPress designs.